The capture of Laurent Nkunda's rebels by Congolese immigration officers is said to have provoked the closing of the border with Uganda, in Bunagana, by Congolese authorities said the local press. There had been reports that the army had also arrested several border agents, who were then released, last week during last week's clashes. 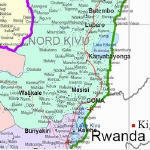 Some sources said that Kinshasa decided to close the border to block 'provision' lines for Nkunda from Uganda. Official sources in Kampala said that their country "gives nothing to Nkunda, nor does it promote any illegal organization in the region". The effects of the provision on economic exchange are starting to be felt: truck drivers have been stopped for the past three days on both sides of the border.